18 September is the anniversary of Jimi Hendrix's death. Hendrix is still universally regarded as the greatest electric guitarist ever, and 39 years on from his premature passing his legend shows no sign of fading. Even in 2009, deluxe reissues of the Hendrix back-catalogue are being prepared for 2010, a biopic is in production by the makers of It Might Get Loud, and the existing Hendrix albums already out there still sell over 1.2 million copies a year. Why is Hendrix, a man who made only three studio albums, still so revered? To The Who's Pete Townshend, "When he started to play, something changed: colours changed, everything changed." Current blues-rock guitar star Joe Bonamassa even tells MusicRadar, "I don't think there's any music that you hear on the radio today that would be possible without Jimi Hendrix." In a visual tribute to an enduring guitar and songwriting talent, here is MusicRadar's succinct timeline of the life of Jimi Hendrix - via classic photos and rare videos. November 1942: Johnny Allen Hendrix (Jimi's real name) is born in Seattle, Washington, USA. September 1957: Jimi Hendrix goes to see Elvis Presley perform. Summer 1958: Jimi's father buys him a second-hand acoustic guitar for $5. "He strummed away on that, working away all the time, any spare time he had," remembered Al. Summer 1959: Al Hendrix buys Jimi his first electric guitar, a Supro Ozark 1560 S.
Video: The first known footage of Jimi Hendrix playing guitar, backing Buddy & Stacey, 1965. July 1962: Jimi is discharged from the army. Over the next four years, Hendrix plays numerous gigs and sessions with the likes of Little Richard, the Isley Brothers and Ike and Tina Turner. Living in NYC, he joins club band Curtis Knight And The Squires. September 1966: Jimi Hendrix and Chas Chandler (former Animals bassist) fly to London. There, Hendrix forms The Jimi Hendrix Experience with Chandler acting as the trio's manager. October 1966: Hendrix jams with (Eric Clapton's) Cream at the Regent Street Polytechnic college. Astounded at Jimi's playing ability, Clapton describes Hendrix's sound as "Buddy Guy on acid." December 1966: The Jimi Hendrix Experience release debut single Hey Joe. The group's debut album, Are You Experienced?, remains near the top of the UK charts through the summer of 1967. June 1967: Hendrix performs at the Monterey International Pop Festival. Brian Jones of The Rolling Stones introduces him as "the most exciting performer I've ever heard." He wasn't wrong. Witness the still-awesome Killing Floor. At the end of his performance, Hendrix sets fire to his Fender Stratocaster. "The time I burned my guitar it was like a sacrifice," he said. "You sacrifice the things you love. I love my guitar. I'd just finished painting it that day and was really into it." Overnight, Hendrix becomes a star in his homeland. December 1967: The Jimi Hendrix Experience release second album Axis: Bold as Love. The album includes evergreens Little Wing, If Six Was Nine, Castles Made Of Sand and Spanish Castle Magic. February 1968: The Experience complete a major US tour. On 12 February, Hendrix returns to Seattle, with Jimi's family seated in the front row. It's the first time he's been reunited with his family for six years. October 1968: Electric Ladyland, a double album recorded in the US and England, is released. It becomes Hendrix's first Number 1 album in the US and includes such iconic tracks as Voodoo Child (Slight Return), Crosstown Traffic and a cover of Dylan's All Along The Watchtower. February 1969: The Jimi Hendrix Experience play their last mainland British performance at London's Royal Albert Hall. June 1969: The Jimi Hendrix Experience play the final date on their last American tour in Denver. At the height of their popularity, the group break up. August 1969: Hendrix debuts a new band, Gypsy Sun And Rainbows, at the Woodstock music festival in New York State. The group includes old army friend Billy Cox on bass, Mitch Mitchell on drums, Larry Lee on rhythm guitar and two percussionists. Due to rain, mud and general disorganisation, Hendrix (the Sunday headline act) takes the stage at 7:30am on Monday, after Woodstock was supposed to have ended. His radical rendition of The Star-Spangled Banner becomes notorious. Was it a critique of the US government's war in Vietnam? Or just an acid-blown jam? Late 1969: Hendrix forms the more funk/soul influenced Band Of Gypsys and plays Bill Graham's Fillmore East in New York on 31 December 1969 and 1 Jan 1970. Graham calls the shows "the most brilliant, emotional display of virtuosic electric guitar playing I have ever heard." Summer 1970: The Band Of Gypsys begin work on a new double-album, First Rays Of The New Rising Sun. It gets a full-release only in 1997. August 1970: A lavish opening party is held at Electric Lady Studios in New York, which Jimi has designed for himself. A few days later Hendrix performs at the Isle of Wight Festival in England. 6 September 1970: Hendrix, Cox and Mitchell play the Love And Peace Festival in Puttgarden, Isle of Fehmarn, Germany. Hendrix then returns to London, after what turned out to be his last proper show. 16 September 1970: Jimi Hendrix jams with Eric Burdon and War at Ronnie Scott's Club. It was his last ever performance. 18 September 1970: Jimi Hendrix dies in his sleep at the Samarkand Hotel in London. He was 27. 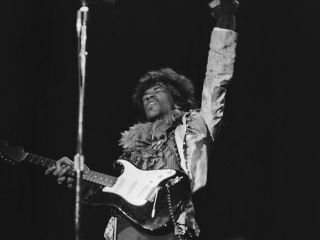 Hendrix is best celebrated in the music he left behind, but sometimes his words are worthy too: "Sometimes you want to give up the guitar, you'll hate the guitar," he admitted. "But if you stick with it, you're gonna be rewarded."